Project 3428: B. M. Wynd, B. R. Peecook, M. R. Whitney, C. A. Sidor. 2017. 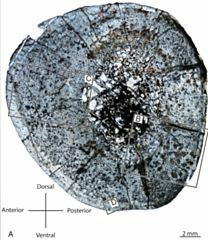 The first occurrence of Cynognathus crateronotus (Cynodontia: Cynognathia) in Tanzania and Zambia, with implications for the age and biostratigraphic correlation of Triassic strata in southern Pangea. Journal of Vertebrate Paleontology. 36 (Supplement to Number 6):228-239. Cynognathus crateronotus was a species of large carnivorous cynodont, first named and best known from the Triassic Burgersdorp Formation (Beaufort Group, Karoo Basin) of South Africa. Fossils of the genus have also been reported from the upper Fremouw Formation of Antarctica, the Upper Omingonde Formation of Namibia, and the Río Seco de la Quebrada Formation of Argentina, but without associated cranial material, distinguishing the postcrania of Cynognathus from that of the closely related cynognathian, Diademodon tetragonus has proven difficult. Here we provide the a more comprehensive diagnosis for Cynognathus crateronotus and describe two novel occurrences. First, parts of a medium-sized individual were recovered from a scrambled mass of dental and semi-articulated postcranial material from the lower Ntawere Formation of Zambia, a horizon that has previously produced fossils of Diademodon and Kannemeyeria. Second, a large individual was collected from a recently discovered locality within the lower part of the Lifua Member of the Manda Beds of Tanzania. A large proportion of the postcranial skeleton, along with some craniodental remains, was found ex situ in a sandy streambed just downstream from a quarry that has produced the dicynodont Dolichuranus, an azendohsaurid archosauromorph, and the avemetatarsalian Teleocrater rhadinus. The widespread occurrence of Cynognathus across southern Pangea demonstrates its utility as a biostratigraphic marker but recently published radiometric age estimates from Argentina suggest that either the genus persisted for over ten million years or that African strata traditionally interpreted as Middle Triassic are better understood as Late Triassic in age.